2016 has been quite the year for biltong. In fact, a lot of publications, like Marie Claire and the Evening Standard have recognised the nutritional value in this South African cured delicacy. Marie Claire has even considered the possibility of it being the new superfood. With that being said, we’d like to take some time to outline the top five Health Benefits of Biltong. With over 40g of protein in a single 100g serving of biltong, the nutritional information is impressive. It’s probably because of this, that biltong, and it’s Amercian counterpart, jerky have been making waves in the health circuit. See, protein is vital for muscle growth and maintenance and promotes healthy brain and heart function too. However, you don’t want to be consuming a high protein product that’s loaded with carbohydrates or fat. Which brings us to our next point. There’s as little as 2g of fat present in a 100g of biltong. What does that mean? Well, Sainsbury’s Whole Almonds contain around 49g of fat per 100g. This, of course, is ‘good’ fat and used in a calorie controlled diet, it’s a great addition to your day. However, the comparison puts the percentage of fat present in snacks into perspective and 2g suddenly doesn’t seem like a lot. Speaking of calorie control, biltong only has around 200kcal in 100g. Biltong has high levels of B-Vitamins, especially B12. This group carries out quite an important job – being responsible for the production of red blood cells and that – which can be helped along by noshing on some cured meat. In response, Vitamin B12 will help keep your nervous system healthy, while also processing folic acid. In addition, this vital vitamin group also helps release energy from the food that you ingest. Now we can’t talk about vitamins and not touch on minerals. There are a few important ones found in our dried beef. First up; Iron. Along with B12, this mineral helps nurture red blood cells – vital for carrying oxygen to important parts of your body. This includes your muscles, making sure they recover from exertion and keeping them in generally good shape. Zinc is another helper in creating red blood cells, but this mineral also assists in the production of enzymes. These enzymes, in turn, help us process carbohydrates, fats and proteins. You also have Zinc to thank for healing wounds and it has been found to improve athletic performance and increase fertility. Perhaps not technically amino acids, but rather byproducts, biltong has Taurine, Carnitine and Creatine present. ‘I have no idea what that means!’ Not to worry, we’ll break it down. Taurine is a key player in cardiovascular function. This would mean it helps with the development, as well as the function, of skeletal muscle and your nervous system. Carnitine’s job involves helping your body use fat as energy. Similarly, Creatine encourages your body to use more energy. This is a great benefit if you’re big on health and fitness, as you’ll see definite improvements when you work out. 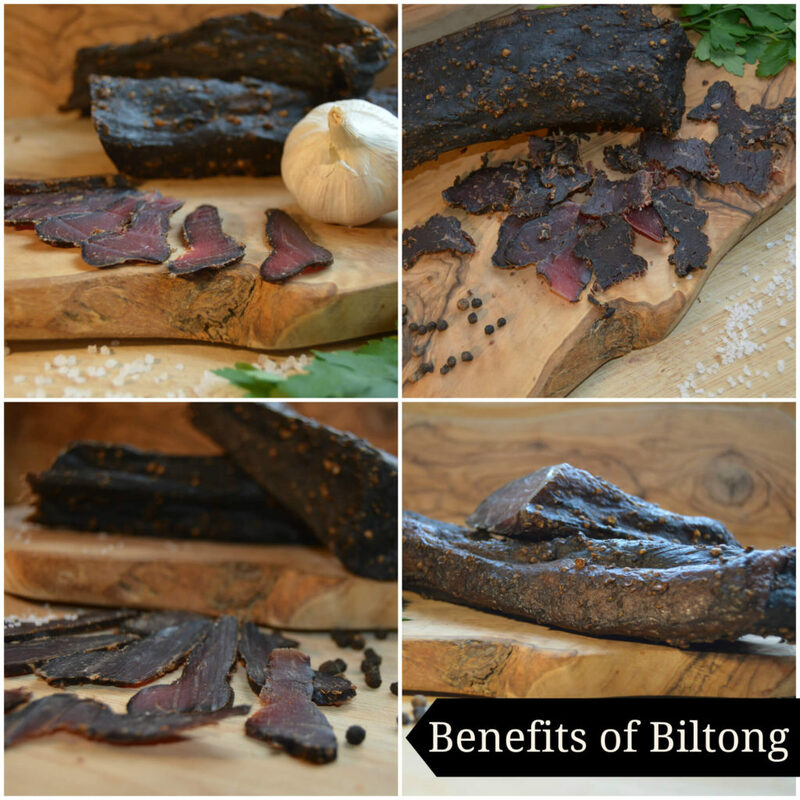 While we’ve singled out five health benefits of biltong, there are many more. What’s the catch? There is none! As long as you exercise portion control, you’re in for a tasty treat with a range of benefits and no downside. So why not get shopping? Click here to shop our delicious range of Grass-Fed Beef Biltong.